It's sometimes a pain to love a filmmaker who wasn't always great. Or, perhaps, he was always great, but he didn't always make great films. Either way, Alfred Hitchcock can be such a pain if you're a completist. Like a great singles artist who makes lousy albums, Hitchcock made some indelible hits and a bunch of crappy album tracks. For every Psycho or Strangers on a Train, there's Mr. and Mrs. Smith, a botched attempt at a screwball comedy completely unrelated to the Pitt/Jolie joint, or Suspicion, a Cary Grant/Joan Fontaine vehicle featuring a heinously bad performance from Fontaine that through some cosmic fluke actually netted her an Oscar. But these were made when Hitchcock was already working in the American studio system, when he had a talented stable of actors, big budgets, and a likeminded producer in David O. Selznick. What to make of Hitchcock's British output, a period during which he worked under considerably more restrictive conditions? Probably a bunch of barely-realized messes, showcases for potential at best, right? The 39 Steps was released in Britain in 1935, half a decade before Hitchcock made his debut on U.S. shores with Rebecca. I had my sights set low. Ho boy. I was wrong. The 39 Steps turns out to be an ideal pairing of vision and means. Hitchcock lacked both the budget and the wherewithal to execute the type of iconic shots that he pulled off in Vertigo (the bell-tower) and North by Northwest (the Mt. Rushmore sequence), but he comes pretty damn close on what must have been a shoestring budget (and in 1935!). Though Hitchcock had already premiered the "wrong man" theme in the 1926 silent film The Lodger: A Story of the London Fog, it's here that he really began to refine it. Hitch's hapless protagonist (though they're never really all that hapless, are they?) 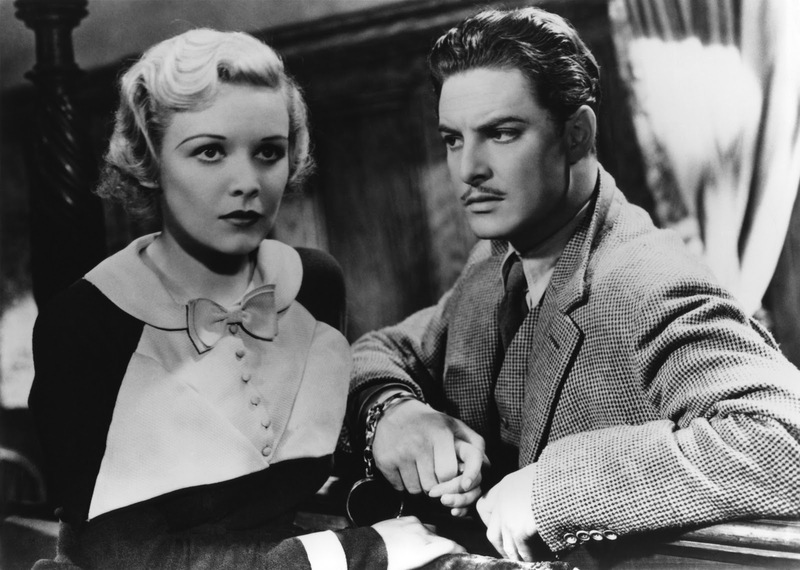 is a Canadian ex-pat named Richard Hannay (Robert Donat), who's accused of murdering a woman named Annabella Smith (Lucie Mannheim, who executes a terrifically awful death rattle). She's actually a spy on the trail of one of those oh-so-insidious international criminal syndicates, this one known as the 39 steps. They're trying to smuggle some kind of military secret out of England and was one of the last people who might've known how to stop them. Hitchcock is often known for creating the first James Bond movie in North by Northwest, but I always thought his spin was so much more sophisticated than the one Albert "Cubby" Broccoli and co. pioneered. Hitch's heroes aren't rubes, but they certainly aren't trained spies. Hannay, like Northwest's Roger Thornhill, is essentially a regular guy, albeit a more wily and articulate version of the regular guy. John McClane with an English degree? Hannay's only hope of clearing his name and unraveling the mystery lies with a professor that Annabella mentioned before she died. The professor, she says, lives in a town in Scotland called Alt-na Shellach. Before he can reach the town, however, the cops discover him, and he has to make a daring escape from a train in the middle of the Scottish countryside. It's interesting to see Hitch play around with a milieu he's not known for, and he gets some nicely atmospheric evening shots. He seems eager to escape the setting, though, and return to the seediness of the city. Not that the country's much better in Hitch's eyes: a brief encounter with a gruff old Scot and his wife reveals that the director thought humanity's jealousy and suspicion transcends geography. The brilliance of the "wrong man" premise lies in the wickedly clever situations Hitch gets to place his heroes in. The best scene in the film has Hannay stumbling into a meeting of a local political party, where he's mistaken for the candidate. 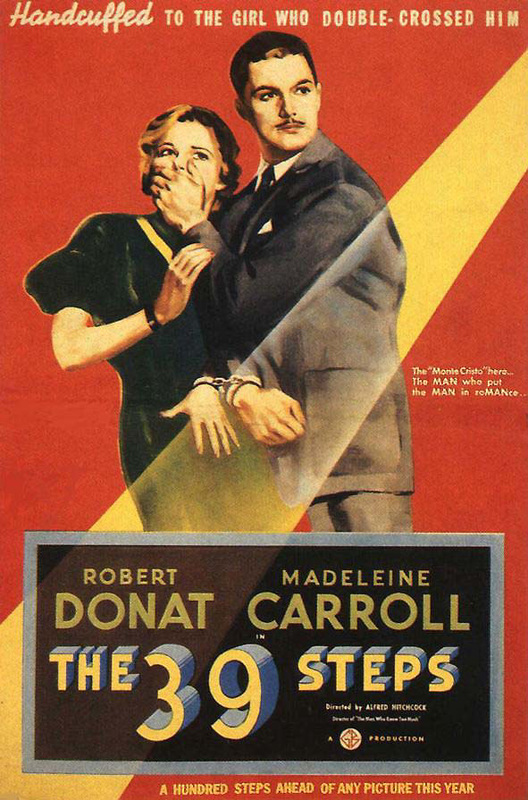 He's trying to elude capture by both local police (who understandably don't believe his story about the crime syndicate) and agents of the professor, who turns out to be a member of the 39 steps himself. Hannay is forced to deliver a speech as the candidate, which manages to say absolutely nothing while being genuinely rousing. Donat's combination of nervous twitches and sweeping gestures is a joy to watch, and Hitchcock captures the scene brilliantly. We're also treated to some great sexual chemistry between Donat and Madeleine Carroll, who plays Pamela, the classic plucky dame who actually spends most of the movie thinking Hannay's guilty. At one point, the professor's agents handcuff the pair together, and Hannay has to contend with being bound to a not-too-pliant young woman who thinks he's a murderer. The scenes of them pretending to be a married couple in a Scottish bed and breakfast are some of the funniest in Hitchcock's oeuvre. Though Hitch devotees might mention Vertigo or Rear Window before The 39 Steps, the film really emerges as one of the director's best. For completists, it's fascinating to watch Hitchcock discovering the "Hitchcockian" style that would become the film critics' equivalent of "Beatlesesque," a stylistic marker so hackneyed that only the most boneheaded reviewers resort to it. For everyone else, it's just a damn good movie. Funny, exciting, gorgeously shot, The 39 Steps is everything people love about Alfred Hitchcock movies, 30 years before François Truffaut pointed out the obvious: that Hitchcock was great the whole time.